The principles remain the same: Above is the 1900 Wheeling & Lake Erie version of Rule 83, while below is Southern Pacific's rendition 78 years later. Below are examples of checking for train arrivals and departures: As we've already noted, the Form V train order was hooped up to crews at points where it was impractical for them to check the train register, and also when a check on extra trains was required. 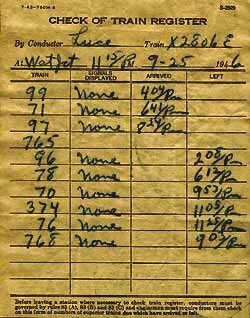 The Check of Train Register was an absolute requirement at Watsonville in 1948, when a large number of regular trains (note the 'Signals Displayed' column) ran on SP rails. 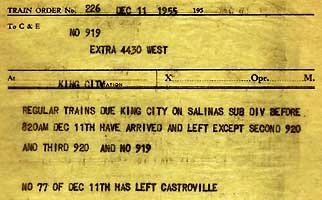 Thirty years later, the Register Check was a mere formality, since the only remaining regular trains through Watsonville were the north and southbound Coast Starlight, which, for arcane reasons, ran as SP #12 (eastbound) & #13, but showed as Amtrak #11 (eastbound) & #14 in public timetables. The question has probably come to your mind about how the station operator always gets a positive identification of passing trains. After all, sometimes a guy just HAS to go to the can. 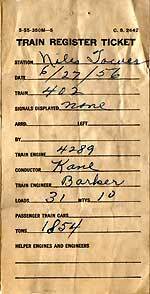 The answer is the Train Register Ticket (center, below). Where required in the timetable (unless relieved of this by train order) the conductor must toss one of these - usually wrapped around a fusee or wad of paper towels - as he leans out of the window to grab his orders. Woe be it to the conductor who forgets to throw off a Register Ticket while the operator is in the can.